Tom Roberts was born at Dorchester, England and upon his father's death came to Australia with his mother and family in 1869. They settled in Melbourne where Roberts studied art at East Collingwood Artisan's School of Design and worked at photographic studios in Collingwood and Melbourne. He also attended the Trades Hall School of Design, Carlton (where Buvelot taught) and at the National Gallery School, Melbourne under Thomas Clark. Roberts returned to England in 1881 and studied at the Royal Academy Schools. He travelled in Spain, France and Italy before returning to Melbourne in 1885, quickly establishing himself as a leading painter of portraits and landscape. With Frederick McCubbin, Louis Abrahams and later with Charles Conder and Arthur Streeton, he painted en plein air in various locations and artists' camps around Melbourne and Sydney. Several of his major works such as 'Shearing the rams', 'A break-away! ', 'The golden fleece' and 'Bailed up' have become pivotal images in the development of a national school of painting. Roberts lived and worked in England between 1903 and 1923, where he completed the monumental commission 'Opening of the first Parliament of the Commonwealth of Australia...1901' (1904). On his return to Australia in 1923 he moved to Kallista, Victoria, the subject of many of his late landscapes. Roberts collated an album of seventeenth century Dutch and French landscape prints, including work by Claude, Ruysdael and Swanevelt, which was presented to the Gallery in 1931. This is one of a handful of etchings by Roberts, which were printed in very few impressions, but not editioned. It is related to a drawing of Buvelot in the Gallery - refer to Australian drawings from the gallery's collection AGNSW, 1997 (9). Both drawing and etching express the great admiration which Roberts had for Buvelot. 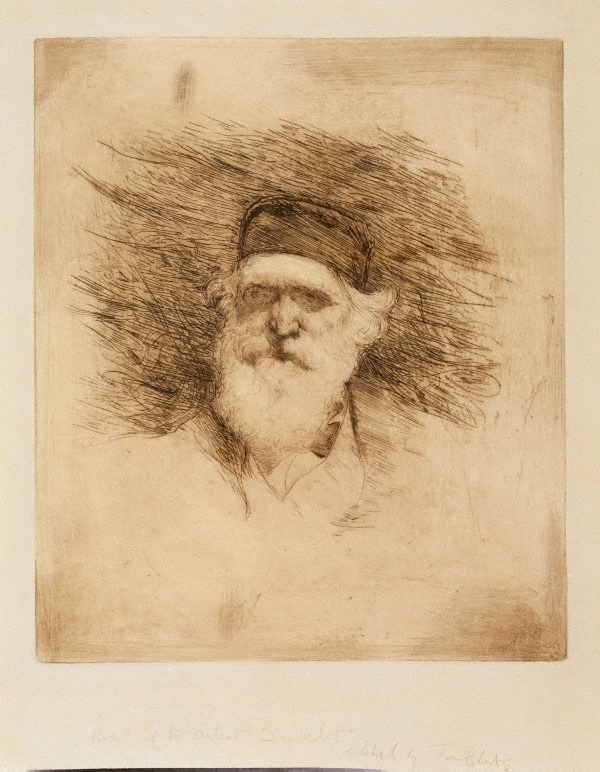 A few proofs were printed from the plate in the 1920s; the plate, now in the National Gallery of Victoria, had been left with Jessie Traill, a friend; this impression reflects her style of printing. Signed l.l. to l.r., pencil " ... Tom Roberts". Not dated.